David Krut Projects is pleased to present Machines of Loving Grace, British-based artist Alexander Massouras’s first exhibition at the gallery. The exhibition’s title comes from Richard Brautigan’s poem of the 1960s, in which he imagines a “cybernetic ecology” created through the union of nature and technology. “Machines of loving grace”—the poem’s final line—captures the utopian paradox of this post-industrial yet pre-lapsarian state of leisure. In Machines of Loving Grace, Massouras recaptures that paradox through form and process. 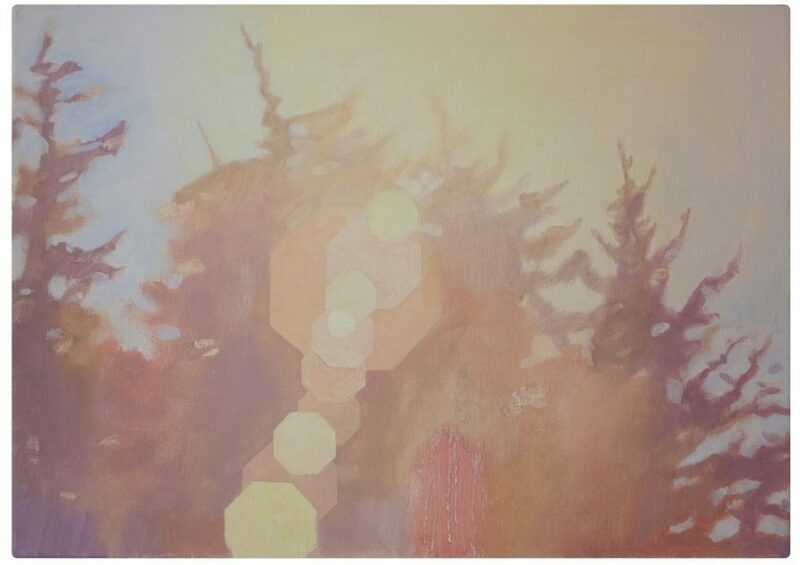 The series Nine Flare Paintings with Octagonal Aperture represents a fusion of the natural with the man-made: images of the sun’s flare on a camera lens, they are distorted exercises in both photorealism and landscape. In these paintings, Massouras overstates the camera’s agency by painting in constructed octagonal flare, introducing mechanical, straight edges to natural imagery of sun falling on treetops. Technology and abstraction become constitutive of the pastoral idyll. These complicated relationships between imagery and form, technology and process, and abstraction and figuration, are recurring themes in Massouras’s work. Since camera flare is a distinctly photographic subject, its rendering in painterly marks creates a mismatch between form and subject, a paradox also central to Polaroid Etchings. In this series, Massouras translates intaglio printmaking into the format of Polaroid 600 instant film. These works again fuse photographic images with manual process, but this time the relationship of technological reproducibility and natural singularity is inverted: it is the hand-made etching that has the capacity for duplication; the machine-made Polaroid is unique. Alexander Massouras is a U.K.-based artist, with work in international private and public collections including the British Museum, the Victoria and Albert Museum and the Rhode Island School of Design Museum. He is currently an Early Career Fellow at the University of Oxford’s Ruskin School of Art. He holds a BA from Cambridge, and a PhD which he completed as part of Tate’s Art School Educated project. His work has been exhibited internationally at venues including the Royal Academy of Art, the Laing Art Museum, Pace, Skylight Projects, Julian Page, Rabley Contemporary and the Jerwood Space. This exhibition forms part of a five month series of exhibitions by British contemporary artists, presented by David Krut Projects, NY, working in collaboration with Jessica Carlisle, a freelance curator and gallerist based in London, UK. The series opened with Piers Secunda (February) and coming up are exhibitions by Vera Boele-Keimer (April), Hester Finch and William Stein (May). Massouras’s exhibition has been organized in co-ordination with Julian Page, a gallerist based in London, UK, who specializes in publishing and dealing in prints.